Last year Intel released the Xeon E5-2600 V3 processor. This was followed earlier this year by the Intel Xeon E7 V3. 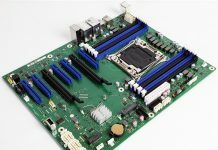 As one would have correctly guessed, today we have the Intel Xeon E5-4600 V3 family which brings Haswell performance to the four socket E5 market. In launching the Intel Xeon E5-4600 V3 Intel has completed the last of its expected Haswell generation architecture launches. One would expect that Intel would do customized versions of these chips if requested by very large customers but the lineup is a fairly standard SKU range from Intel. 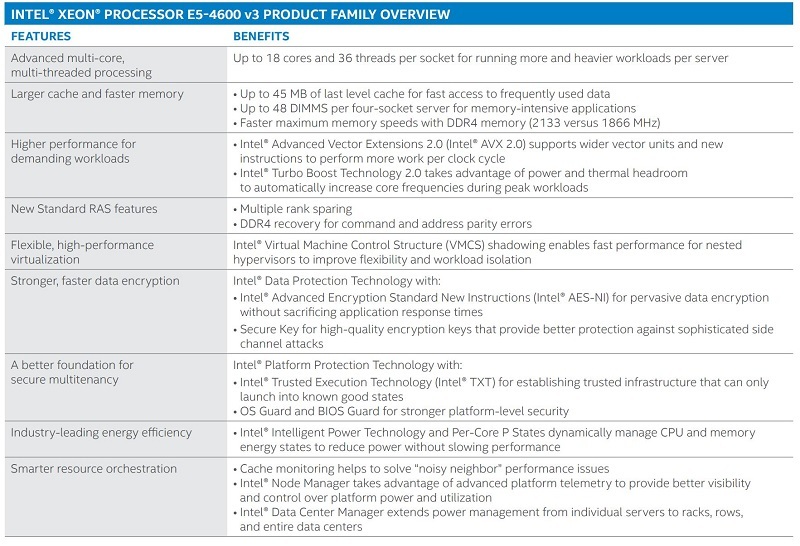 Since we have talked about the Haswell architecture in the E5-2600 V3 launch piece, the E7-4800/8800 V3 launch piece and the E3-1200 V3 launch piece (extensively) here is Intel’s guide to what is new. Certainly key areas of improvement across the board. One would be correct in largely considering this an incremental upgrade in-line with what we saw with other V2 to V3 Haswell architecture moves. The Intel Xeon E5-4600 V3 systems will likely sell for less than their E7 counterparts. 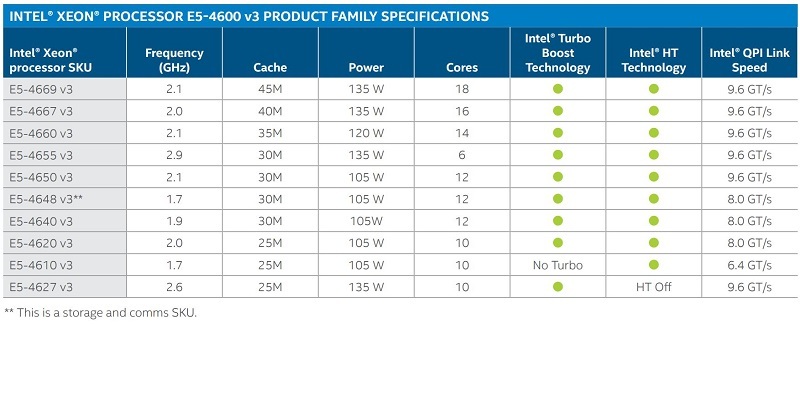 The main reason we are seeing this launch towards the end of the Haswell timeline is simply that the E5-2600 line is the high volume family for Intel, so that is always released first. The Intel Xeon E7 family is the higher-dollar line-up so we see that second chronologically. The Intel Xeon E5-4600 series comes last so as not to detract from the marketing of the other two. One very interesting note here is that the Intel Xeon E5-4600 V3 does have a big advantage for next-gen storage over the E7 V3 family: PCIe lanes. Whereas the Intel Xeon E7 V3 series has 32 PCIe lanes per socket, the Intel Xeon E5-4600 V3 family has a full 40 lanes per processor. We are told the reason for this is a legacy marketing decision an the E7 V2/ V3 PCIe controller can handle 40 lanes but it was not given the pins to do so. That decision means the Intel Xeon E5-4600 V3 family has 25% more potential PCIe bandwidth than the Intel Xeon E7 V3 family. We will hopefully be getting time on an Intel Xeon E5-4600 V3 system soon to benchmark using Linux-Bench. Stay tuned for more. $2405.00 E5-4548 http://ark.intel.com/m/products/85761/Intel-Xeon-Processor-E5-4648-v3-30M-Cache-1_70-GHz#@product/orderingandspec -OUCH ! Those extra PCI Lanes are indeed needed. How do we do 4 GPUs and NVMe RAID; yet have Lanes remaining for a couple more Cards. It’s gonna take Pins on the Chip, and that’s gonna cost big – bad for ‘Gamers’ (this year), good for the rest of us when the cost (demand / crying) comes down. Makes me wait to buy, again.